When the ICC Cricket World Cup kept majority glued, a Football Match stole the attention of some in Bangalore. It was the National Finals for Football Fives World Championship India 2015, hosted by SPT Sports. After Months of Training, Travelling, Knockouts and Rigorous Practice, 3 Teams qualifed for the Finals: Flipflops from Aizawl, Football Aura from Mumbai and GYFCC from Guwahati. Without substitutes the GYFCC team ran out of steam and the other two teams did clash comfortably to reach the finals. The final competition was fierce, the tackling was tough and no one could absolutely guess who would make it to the final. But, the team Flip Flops caught most by surprise by their exceptional skill, pace and all the tricks, scoring 7 goals in the final. 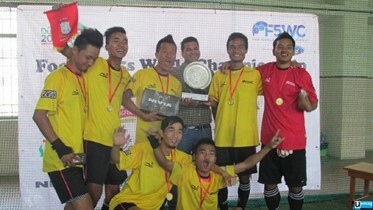 The final was a comprehensive win for the Flipflops from Aizawl scoring 7-2 against Football Aura - Mumbai. The Team ended the game offering due respect to the Gods they believe, leaving the audience compelled to say that they deserved it. "I am Speechless", said the Captain of FlipFlops with moist eyes when asked about his feeling of winning the match. The Team FlipFlops will represent India at the F5WC World Cup 5-a-side Tournament - Dubai. 2016 is fast Approaching! Start getting your teams ready for your chance to win an all expenses paid trip to Dubai! Good Luck! Any facts, figures or references stated here are made by the author & don't reflect the endorsement of iU at all times unless otherwise drafted by official staff at iU. This article was first published here on 7th April 2015.